Some restaurant dishes are made to be doggy-bagged and reheated in the microwave the next day. Not French fries: The more crispy and delectable they are when they first arrive on your table, the more of a soggy disappointment they’ll be when you try to revive them at home. But as The Kitchn recently shared, there’s a secret to making leftover fries you’ll actually enjoy eating. The key is to avoid the microwave altogether. 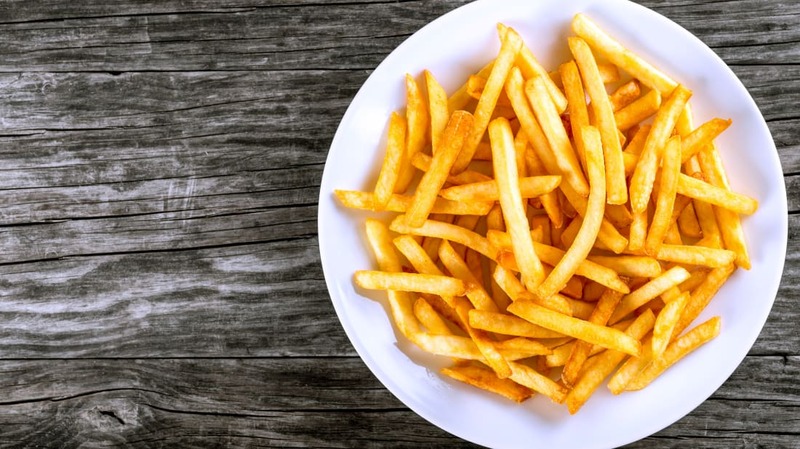 Much of the appeal of fries comes from their crunchy, golden-brown exterior and their creamy potato center. This texture contrast is achieved by deep-frying, and all it takes is a few rotations around a microwave to melt it away. As the fries heat up, they create moisture, transforming all those lovely crispy parts into a flabby mess. If you want your fries to maintain their crunch, you need to recreate the conditions they were cooked in initially. Set a large pan filled with about 2 tablespoons of oil for every 1 cup of fries you want to cook over medium-high heat. When you see the oil start to shimmer, add the fries in a single layer. After about a minute, flip them over and allow them to cook for half a minute to a minute longer. By heating up fries with oil in a skillet, you produce something called the Maillard Reaction: This happens when high heat transforms proteins and sugars in food, creating the browning effect that gives fried foods their sought-after color, texture, and taste.